A fresh fragrance exclusively created for daily use, Set Wet introduces new range of deodorants for men that are a burst of colour, energy and youthfulness.They keep you smelling fresh and appealing round the clock! About the fragrance - You are the king of sun & sand. The sporty one, who is up for anything. You enter & the beach comes alive. You play ball. You pull off stunts on water. And of course, are tagged in every beach selfie. Make Set Wet your ally. Your avatar is Cool Avatar. This is a breezy fragrance with a fresh breath of mint and ginger, woody under tones, a whiff of Musk and a trail of Vetiver. Explore the entire range of Deodorants/Roll-ons available on Nykaa. 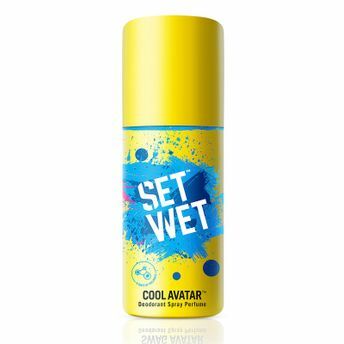 Shop more Set Wet products here.You can browse through the complete world of Set Wet Deodorants/Roll-ons .